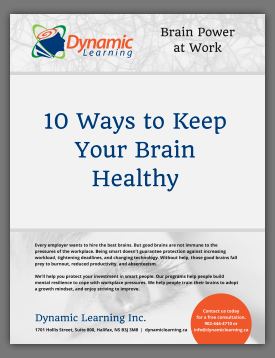 After examining the answers from one million employees and eighty thousand managers, the authors of this book distilled out some fascinating and important information from 25 years’ worth of research gathered by the world renowned Gallup Organization. The most important information was that great managers think and behave very differently from what conventional wisdom would predict. And great managers are the crucial difference between consistent, excellent business measures and simply average ones. Great managers “Break All The Rules” because they believe that not everyone can do everything, that it is a waste of time to work on weaknesses, that it is a mistake to treat people as you would like to be treated, and that it is important to spend most of your time with your best people. Over the many years that Gallup gathered their data, they consistently asked their clients to identify their best managers – the ones they would dearly love to clone. They also used performance scores like those measuring productivity, profit, absenteeism, employee accidents, and customer feedback. To clarify what they meant by talent, Buckingham and Coffman referred to the latest understanding from research in brain development. We are all born with billions of brain neurons, which over the first few years of life form connections with each other. By the time someone is about 13 years old, some connections are smooth and swift like “a four lane highway”, while others are bumpy and slow. Due to both nature and nurture, we are all attracted to certain patterns of thought, feelings, and behaviour. Those “roads” in our brain that have the most traffic get widened, while the ones that are rarely used fall into disrepair. Talents are unique and enduring. They are part of one’s mental filter on the world. Knowledge can be acquired, skills can be practiced, but talents are part of who you are and are extraordinarily difficult to teach. Great managers are good at figuring out what talents are needed for a particular role, selecting the right person, and making their expectations of that person very clear. They focus on the employee’s strengths, give frequent feedback and constantly challenge the employee to grow stronger and more expert in his or her role. 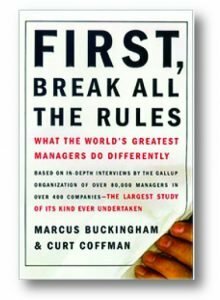 “First Break All The Rules” is well worth reading if you want to be a great manager, or hire a great manager.